Dura-Shine Clean is proud to announce its selection by the Pasco Chamber of Commerce as the 2013 Business of the Year. 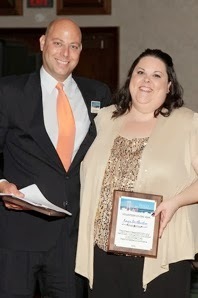 The Chamber also honored Dura-Shine Clean Marketing and Sales Director, Angie Brotherton, as Volunteer of the Year. The awards were presented at the annual Sunshine Ball on Saturday, September 7, 2013 at the Pasco Red Lion. The Sunshine Ball serves as the chamber's annual meeting where outgoing and incoming board members, as well as board presidents, are recognized. Award recipients are nominated and selected by the Pasco Chamber Executive Board of Directors. Dura-Shine Clean was recognized for its continued support of events such as the Sagebrush Scramble golf tournament and its maintenance of the Pasco Chamber of Commerce facility. “It is a high honor to be recognized by the Chamber for these awards,” Carlos Martinez commented on the selection. “We work hard to be our best in business and to be the best community partner we can. It's truly special for our company and staff to be recognized for those efforts.” Ms. Brotherton was acknowledged for her contributions during her tenure as a board member, assistance with the Sunshine Ball event, along with other committee work. An active community member, Angie is a graduate of Leadership Tri-Cities and presently serves as secretary on the Leadership Tri- Cities Alumni Association board. Dura-Shine Clean currently services over 4 million square feet of office space and provides residential cleaning to over 100 clients. Including membership with the Pasco Chamber of Commerce, Dura-Shine Clean also lends its support to the Tri-Cities Regional Chamber, Tri-Cities Hispanic Chamber, numerous community organizations, and non-profits organizations.